Considerable cloudiness with occasional rain showers. Low around 60F. Winds light and variable. Chance of rain 70%.. Considerable cloudiness with occasional rain showers. Low around 60F. Winds light and variable. Chance of rain 70%. A State Department scholarship allowed Catherine Cata to further her ballet studies, learn Russian and explore the history and culture of Moscow. 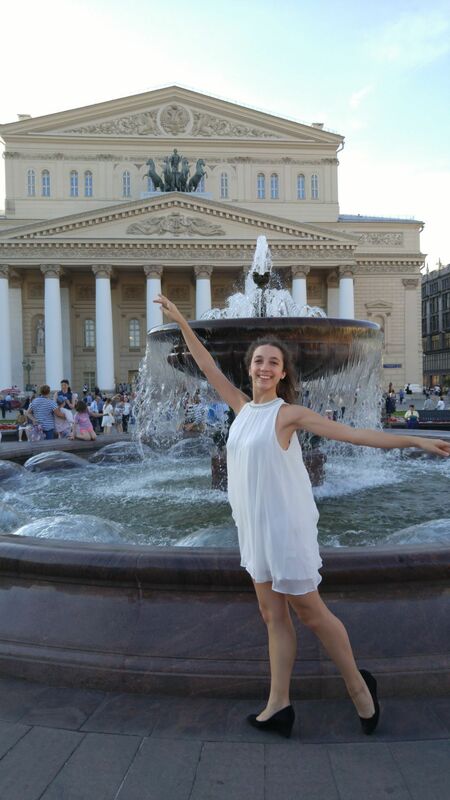 Stafford County resident and ballerina Catherine Cata poses in front of the famous Bolshoi Theatre in Moscow. She just spent a summer in Russia studying and pursuing her love of dance. For Catherine Cata, the worlds of ballet and international relations share a deeply entwined relationship. This summer, the 17-year-old ballerina from Stafford County traveled to Moscow in the joint role of ballerina and diplomat to study language, culture and ballet for six weeks at the prestigious Moscow State Academy of Choreography, more commonly known as the Bolshoi Ballet Academy. When she first arrived in Moscow, Cata said the experience felt surreal. Cata, who attends Colonial Forge High School, is one of about 600 students from across the nation who received a National Security Language Initiative for Youth scholarship from the U.S. State Department’s Bureau of Educational and Cultural Affairs. The NSLI-Y program aims to advance international dialogue by sparking a lifetime interest in foreign language and culture among U.S. youth. While in Moscow, Cata followed a rigorous schedule that included dance in the morning, Russian language classes in the afternoon and long hours of homework late into the night. On the weekends, she stayed with a host family, which allowed her to experience the everyday lives of Russian families firsthand—and eat a home-cooked meal. Being in a foreign country also had its challenges. Cata had to learn to ask for directions in Russian in order to find her way around the city or order a coffee. At the academy, she had to adjust to the tilt of the floors, since European stages are higher in the back than in the front. In other areas, however, Cata felt right in her element. She has been taking ballet since she was 3 years old, and has been attending Classical Ballet of Fredericksburg for about five years. The studio follows the Vaganova method. The studio’s director, Regina Bogomolova, explained that Vaganova is an international syllabus that includes eight levels. All of Bogomolova’s students dance competitively, and she has placed several dancers with major companies. “Ballet has been a wonderful part of my life and I love sharing it with my students,” Bogomolova said. She is honored to have students such as Catherine, she said, and enjoys watching them have experiences that wouldn’t have been possible if they didn’t have ballet in their lives. She noted that even if her students do not become professional ballerinas, the study of ballet fosters an appreciation for the arts. They will be the ones continuing to buy tickets to see the ballet. Cata was unfazed by the rigor of the program in Moscow. At home, she follows a similarly strict schedule involving school during the day, several hours of dance practice at the studio in the evening and then homework. On the weekends, she spends as many as eight hours a day practicing ballet. Even with her busy schedule, Cata somehow manages to incorporate her interest in international relations into her life. She is president of Colonial Forge’s Model United Nations Club, which she helped to rebuild as a freshman. She also represented the school at Virginia Girls State this past summer. Cata hopes to study international relations, ballet and Russian language after graduating in the spring. Wherever life takes her, Cata will treasure the experience at the Bolshoi Ballet Academy forever.